CLICK HERE and sign up to receive 15% OFF your next purchase! Huckleberry Lane's babies designer sleepwear range includes styles for summer & winter. We design and produce pyjamas, girls nighties, rompers, children's underwear and wraps for bot boys & girls. We also stock a baby basic range of sleepwear with neutral tones and simplistic yet classic designs. Huckleberry Lane design & produce a wide range of children's sleepwear including pyjamas, nighties, rompers, underwear & wraps. Our children's sleepwear is designed to suit both summer & winter with products being made from comfortable soft cotton fabric. Huckleberry Lane's teen sleepwear features bold designs featuring classic designs, stripes and polkadots! All of our teen sleepwear items are produced in soft cotton fabric making them super comfy and suitable for both summer & winter. 100% cotton. 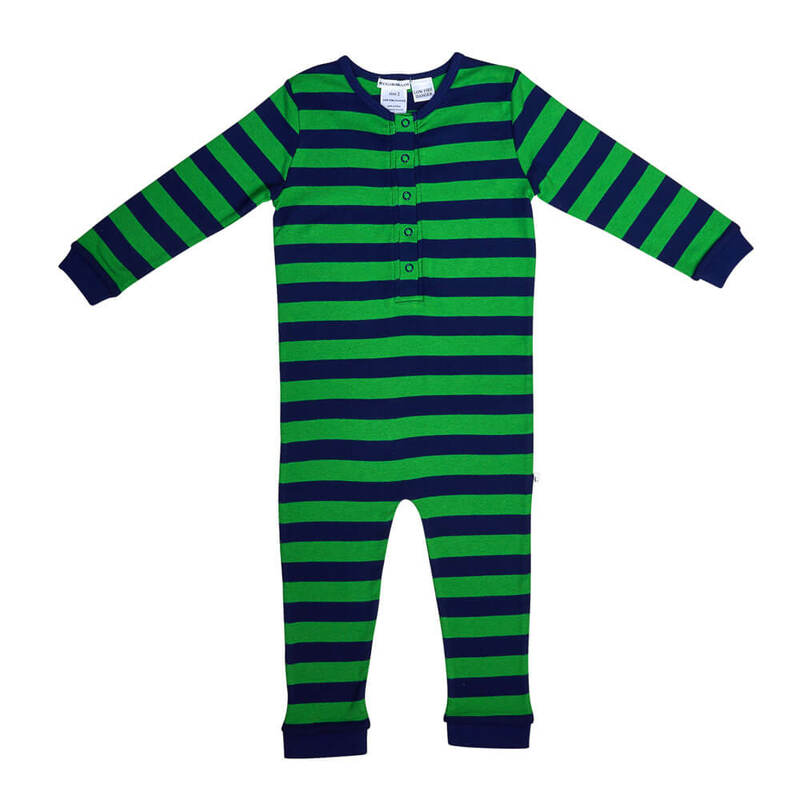 Navy & Green Striped Onesie. Press stud button detail on centre front. Comfortable and super soft. Perfect for a good nights sleep and lounging around on a Winter's morning. A perfect gift for your little one. For more information see our Deliveries & Returns page. Go to bed in style. © Copyright 2016 Huckleberry Lane Pty Ltd. All rights reserved. Secure payments provided by PayPal. Sign up to our newsletter for 15% OFF your first purchase. Click Here !